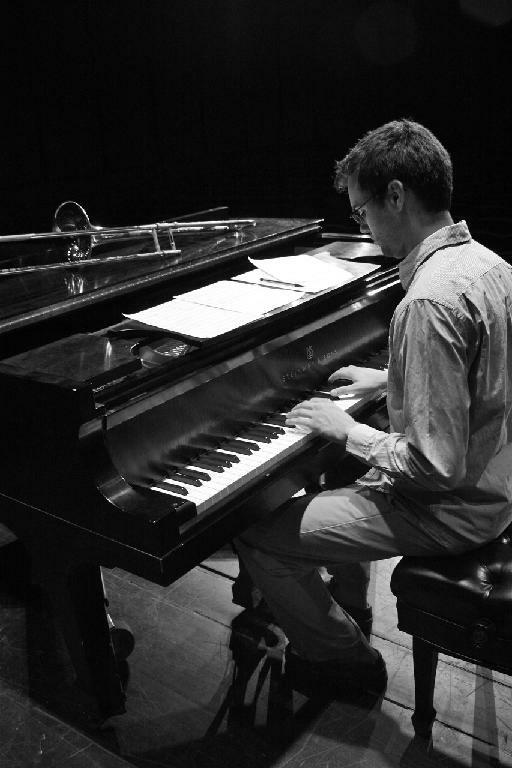 On Monday and Tuesday, April 14 and 15, the Centennial Bands will host jazz trombonist, pianist, and composer Michael Conrad as a guest artist in residence. Mr. Conrad will spend the two days working with jazz students at Prairie Ridge Middle School, Northview Middle School, and Ankeny Centennial High School. He will also be presenting master classes on jazz trombone, jazz piano, improvisation, music theory, and careers in music at all three schools. The Jazz Residency Concert will be Tuesday, April 15, in the Centennial Auditorium at 7:00pm. Tickets are $5 for adults and $3 for students, seniors, and veterans. Click here for a full Schedule of Events. Mike Conrad is a trombonist, pianist, composer, arranger, and teacher from Bettendorf, IA. He earned a Bachelor’s Degree from the University of Northern Iowa where he studied with Chris Merz and Bob Washut, and a Master’s Degree from the Eastman School of Music where he studied with Bill Dobbins. Conrad’s lead trombone playing as well as his compositions and arrangements can be heard on multiple UNI Jazz Band One CDs. Conrad has performed at the Iowa City Jazz Festival, the Rochester International Jazz Festival, and the Umbria Jazz Festival in Perugia, Italy. His pieces have been premiered by the Eastman Jazz Ensemble, the Penfield Jazz Commission Project, the West Point Army Jazz Knights, the New York Youth Symphony Jazz Band and COLOSSUS. Some recent highlights from his arranging career include a string quartet that was performed at Barack Obama’s 2nd inauguration and a jazz octet that was performed at Carnegie Hall. Conrad has received the Jack L. Frank Award for Excellence in Teaching from the Eastman Community Music School and currently directs the Wind Symphony and both jazz bands at West High School in Waterloo, IA.